TUESDAY JANUARY 16 (Valhalla, NY) – After missing eight games with an injury, sophomore Monte Lambert (Brooklyn, NY/James Madison HS) is quickly finding his groove, which could be essential if the Westchester Community College Men’s Basketball team is going to make a run during the final stretch of the year. On Tuesday night, Lambert enjoyed his finest effort since his return, registering a double-double with 16 points and 11 rebounds as Westchester earned its third straight win, 75-66 over visiting Raritan Valley Community College at Viking Gymnasium. With the win, Westchester is now 11-5 for the 2018-19 campaign. Lamert got off to a slow start, but the entirety of both teams seemed to do the same as neither team found the basket for the first 2:17 of play. Raritan Valley jumped out to an early 6-2 lead, but a 10-0 Westchester lead put the Vikings ahead 12-6. From there, the teams went back and forth throughout the first half. The Vikings led by seven during the final minute of the opening half, but Raritan Valley was able to cut the deficit to four points, 43-39 at halftime. Raritan (5-11) scored six of the first eight points to start the second half, and led 47-45 with 16:59 to play, but and neither team led by more than three points until a late 13-4 WCC run put the hosts by 10 en route to their first home win in 42 days. Freshman Joe Zayer (West Nyack, NY/Clarkstown South HS) scored 15 points and added five assists and four rebounds, while freshman Nathan Emanuel (Suffern, NY/Suffern HS) added 10 points. Overall, Westchester enjoyed a 47-33 rebounding edge, and turned the ball over only 16 times, compared to 21 for Raritan Valley. Both teams shot 43% from the floor. SATURDAY JANUARY 19 (New Rochelle, NY) – Sophomore Monte Lambert (Brooklyn, NY/James Madison HS) scored a game-high 16 points, and fellow sophomore Maurice Hollis (Bronx, NY/Tuckahoe HS) added 14 points. Westchester Community College Men’s Basketball team saw their three-game winning streak come to an end with a 72-52 loss to ASA College during the opening round of the Monroe College Tournament on Saturday at Monroe College. With the loss, Westchester is now 11-6 for the 2018-19 season. The game was far closer than the score indicated as the Vikings held ASA off the board for the first 3:03, and scored the game’s first six points. From there, the teams went back and forth for the rest of the opening stanza. A Hollis three-pointer with 5:47 to play in the first half tied things at 25, but a 9-1 Avenger run gave ASA a 34-26 halftime lead. The second half saw the Vikings desperately try to even things up, and Westchester appeared to be poised for a late run when a pair of Lambert free throws with 7:29 to play made it a 58-50 ASA lead. However, from there, ASA outscored the Vikings 14-2 over the remainder of the game, giving ASA a 20-point win. Overall, Westchester was out-rebounded 48-29, and ASA shot 47% to Westchester’s 33%. SUNDAY JANUARY 20 The Viking’s game at Monroe of New Rochelle was cancelled due to the weather forecast. SATURDAY JANUARY 19 (Carmel, NY) – Freshman Edward Aiken (Middletown, NY/Pine Bush HS) turned in one of the greatest individual performances in the storied history of the Westchester Community College Bowling program. Sophomore Matthew Rice (Lagrangeville, NY/Arlington HS) enjoyed another stellar day as the Westchester Community College Bowling team finished in third place at the Blue and Orange Classic in Carmel, New York. 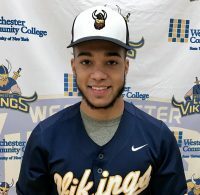 Westchester finished a competitive third behind champion Suffolk Community College, and Erie CC to enjoy a top-three finish for the second consecutive week. Aiken was absolutely brilliant, finishing second in All Events with a 231 average. During the fourth game of the tournament, Aiken made Westchester CC history by bowling a 279, which registered as one of the 10 best singles effort in the history of the program. Aiken also bowled a 257 during his sixth game, and broke 200 four out of five times. Rice enjoyed a sixth-place finish to earn a spot on the All-Tournament Team with Aiken, averaging 200. During the second game, Rice bowled a 225, and broke the 200 mark three times. The doubles team of Aiken and Rice also enjoyed a fine day, finishing in fourth place with a 1230. Also for Westchester, freshman Matthew Rush (Valhalla, NY/Valhalla HS) finished in 14th place with a 163.33 average, finishing just a hair ahead of sophomore Anthony Mignone (Scarsdale, NY/John Jay HS), who had a 163.17 average. SUNDAY JANUARY 20 The Westchester Invitational at Farmingdale Lanes, was cancelled due to the weather.